Destination : Hawaii — Where will you be checking in next? "Why travel so far?" The question is legitimate, considering that the Hawaiian islands are located at 4500 km off the mainland. The six islands that make up the Hawaiian archipelago are the most isolated in the world. It is a state of almost untouched natural beauty where one finds breathtaking landscapes. The four major islands : Maui, O'ahu, Hawai'i (Big Island) and Kaua'i, are all different and each has its own characteristics. It is therefore worthwhile to visit them all, for a unique travel experience. The island of Oahu, where Honolulu International Airport is located, is the most developed and commercial of the Hawaiian Islands. 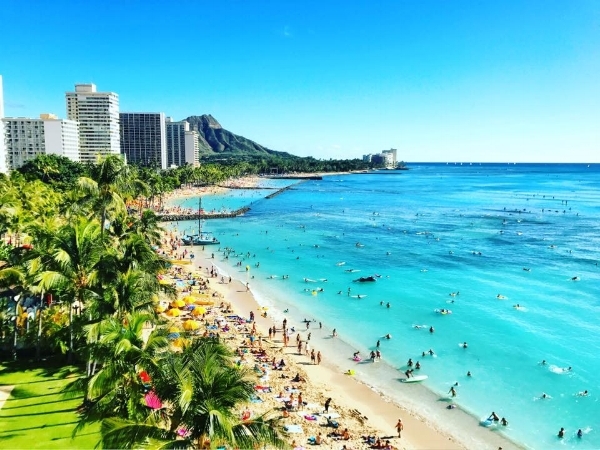 You will find the most popular beach in the world, Waikiki, as well as the extinct Diamond Head volcano, which you can climb. Hanauma Bay is also one of the most beautiful beaches in Hawaii and an incomparable dive place. O'ahu is the nerve center of Hawaii, but it is also an interesting island that combines beautiful landscapes and cultural dynamism. The Moana Surfrider, which recently celebrated its 117th anniversary, was the first hotel to be built on Waikiki Beach. Located in the heart of the action, the hotel has an irresistible charm, a private section on Waikiki Beach and rooms with views of Diamond Head. We like its elegant "colonial house" style and its inner courtyard where you can bask under the "Banyan Tree". The Veranda restaurant also offers afternoon tea service. Very stylish. The restaurant offer is particularly interesting on O'ahu considering that the heart of the economic activity of Hawaii is there. The gourmet counter Tucker & Bevvy offers lunch box service for a picnic on the beach, and in the hip district of Kaimuki, Town Restaurant continues to garner praise. Kauai, which is called "the Garden Island", bears its name very well. Very "green", it is still in the wild. For lovers of mountains and outdoors in search of solitude, Kaua'i is for you. The island, which is barely 170 km long, allows rapid passage from one micro climate to another. To the south, you will find long sunny beaches almost deserted and to the north, tropical climate and breathtaking mountainous landscapes. Koa Kea Resort is the only boutique hotel in South Kauai. With only one hundred rooms, the luxurious resort is located directly on the popular and beautiful Po'ipu Beach. One feels really alone in the world, lost in paradise. The hotel also boasts one of the best restaurants on the island, the Red Salt. Located nearby, the RumFire restaurant offers a 180 degree view of the sea and is one of only a few restaurants on the island to serve fresh lobster from the Big Island. At the historic village of Koloa, you will find the Koloa Fish Market for a quick poke done right and the Cortado Coffee Bar for an open-air espresso. North of Kaua'i, the landscapes are dramatic, nothing less. In the heart of the mountains, nothing compares to the site of the St Regis Princeville. The hotel is the only establishment of the prestigious St Regis brand in Hawaii. The view from the coast of Na'pali, in the distance, is breathtaking. Take the opportunity to climb the nearby Waimea Canyon, which offers a panoramic view of the island. Maui is the second biggest island of the archipelago after "Big Island". Recognized for its beautiful beaches and luxurious hotels, it offers a good mix between the islands of Kaua'i and O'ahu. Kaanapali Beach, located on the west coast, near the bustling city of Lahaina, is the signature beach of western Maui. It is more than five kilometers long and in the distance you can see the islands of Molokai and Lanai, a difficult view to beat. In Maui, the scenery is magnificent from every point of view and offers the opportunity to discover the popular "Road to Hana", a winding road of a hundred kilometers linking the west and east coasts of the island. In Kaanapali, there are many restaurants, shops and hotels to suit all budgets. The Westin Maui is an excellent accommodation option whether you are traveling as a couple or as a family. Perfectly located, the hotel is directly on the beach, within walking distance of everything. With five swimming pools, water slides, a garden with birds and tropical fish, you will feel in an exceptional place. The district of Wailea, one of the recent ones of the island, is worth the detour for its numerous restaurants and exceptional shops. Among other things, the Ka'ana Kitchen offers one of the best breakfasts ever tasted. Opt for the ultimate option, the "Breakfast Experience" which includes: a freshly squeezed juice bar, pancake and waffle stations and variety of fruits and quality local products. A little further, the Monkeypod Kitchen offers top-quality local cuisine at great prices and the evenings are always lively. Hawai'i Island, nicknamed "Big Island", is, by itself, wider than all the other islands combined. In Hawai'i Volcanoes National Park, we find the largest volcano in the world, Mauna Loa, and Kilauea, considered to be the most active. "Big Island" is mostly characterized by its numerous volcanoes and there are, on several beaches, dried lava. The black beaches are common on this island precisely, out of the common.